Finding the best adjustable monitor arm is not such an easy task, especially with the number of products, manufacturers, styles, and different functionalities available. If you’re searching for a well-rounded and high-quality product, we recommend the AmazonBasics Single Monitor stand for its amazing adjustability for optimum ergonomic value, but we suggest you continue to read this article to find out exactly what type of adjustable monitor arm is right for you. It’s time to throw away your textbooks, shoeboxes, or aluminum cans that you currently use to keep your screen at the right height, and use an adjustable monitor arm that is sleek, stylish, and great for your posture. Many people these days are sick and tired of being, well, sick and tired! Ok so that not quite true, but if not sick and tired, maybe sore and achy. Sitting all day long at a desk can be terrible for your posture, your spine health, and can end up causing a number of issues with sore shoulders, muscle imbalances, headaches and more. Standing is definitely a healthy option to alleviate these pains, but if you’re standing and still looking down at your screen, you’ll have the same issues. Well, it seems like an adjustable monitor arm might be THE ANSWER for you. An adjustable monitor arm screws onto the back of your computer monitor and then clamps to your desk, the wall, or even stands freely, allowing you to maneuver it as you please. 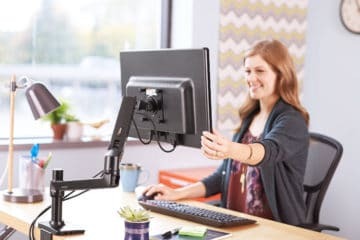 Unlike a regular monitor stand that only gives you minimum height adjustment ability (if any) and moving it from side to side requires shifting your whole desk around, a monitor arm will give you the flexibility to have your screen at the perfect height. Say goodbye to headaches, neck pain, sore shoulders and more, the best monitor arm will be a step forward in alleviating that. If you are looking for a monitor arm, take a look at some of the products (single, dual, and multi arms) that we rate highly in our monitor arm list. What’s more… these are fantastic to use with standing desks, and can even fit dual monitors, triple monitors, quadruple monitors, and quint- ok we think you get the point! 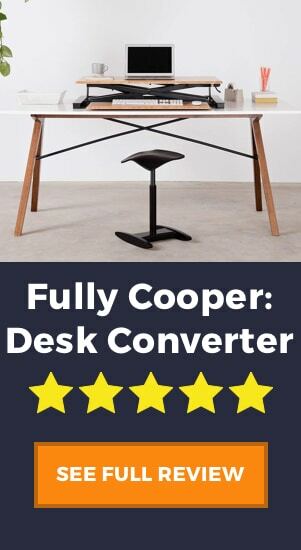 If you haven’t heard about standing desks and want to know more, get started with our guide to the best standing desks, or check out here our full review of one of the best standing desk converters. A desk clamped monitor arm clamps to the very edge of your desk and takes up a minimal amount of space. Suddenly, you’ve freed up a huge amount of desk space and will feel liberated with less clutter directly in front of you. Having less clutter has also been linked to higher productivity rates, because as they say “a clear desk is a clear head”. Moreover, the monitor arm will allow you to change the height, lateral position, angle, and depth of your monitor. This will reduce stress on the neck and back from not having to stare downwards, and also it will put far less stress on your eyes. It is very common, too, for a monitor arm to be used in conjunction with a standing desk. Standing desks are popular these days for the huge posture benefits, and by adding a monitor arm you can rest assured that your workspace will be truly ergonomic. Which monitor mount should I get? 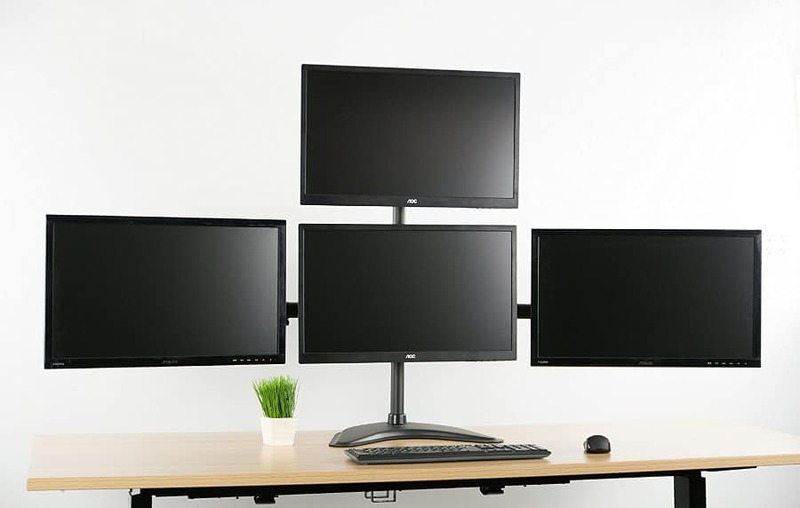 Essentially, monitors can be held in 3 distinct ways: on a stand on the desk, with a mounted monitor arm clamped to your desk, or with a wall-mounted monitor arm. This article is about finding the best adjustable monitor arm, and for that reason, we will only look at the second two options. In our opinion, a typical monitor stand is just not adjustable enough, and moreover, it takes up a huge amount of space on your desk. 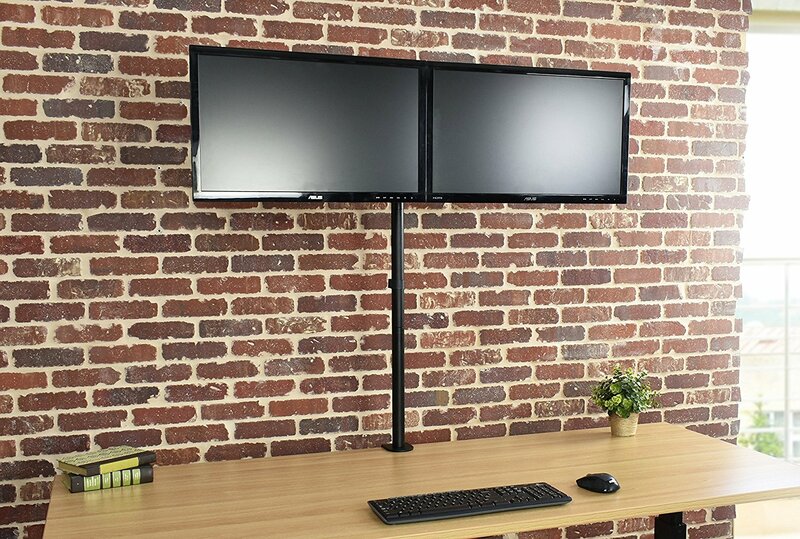 So, should you get a desk-mounted monitor arm or a wall-mounted one? The answer really comes down to personal preference and the location of your desk as the functionality of the monitor arm will be almost identical. 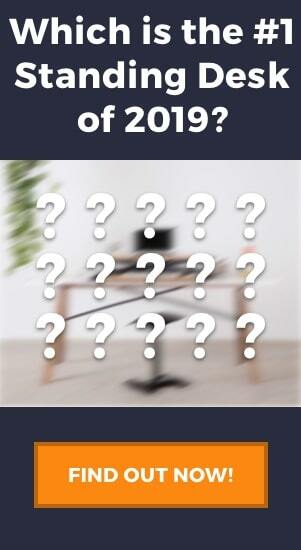 Do you need to move around and move your desk and monitor together? If yes, then go for the desk clamp. Do you have a beautiful desk and you don’t want to cause any damage using a clamp? Then attach it to the wall. Before you buy your monitor arm or even your monitor, check to see that it is VESA compatible. VESA is the Video Electronics Standards Association, who have set a standard for how all TVs, monitors, and flat panel displays should be mounted. Put simply, the VESA standard is a certain arrangement of the screws and holes that allow you to connect your monitor to the monitor arm, and different sizes of screws in order to handle different weight classes. Check the back of your monitor to see if it has the correct VESA compatible mount before buying a VESA monitor arm. Some products will not have this VESA compatibility, for example, most monitors from Apple. There exist a number of adapters that allow you to connect a non-VESA monitor to a VESA monitor arm, but this is not a guaranteed solution. For this reason, we say you make certain that the monitor is VESA compliant or there is a suitable adapter available. Computer monitors come in all sizes, ranging from smaller 15-inch displays, all the way up to 40+ inches. It is important to note the weight of your monitor for two reasons: VESA compatibility (as we mentioned above), the maximum lift capacity of the monitor arm. As we mentioned before, there are different levels of VESA compatibility, which affects the distance between the screw holes on the back of your monitor. Make sure that your monitor arm will align correctly before buying the incorrect VESA type. Secondly, the weight will affect the lifting capacity of the monitor arm. You want to make sure the arm is capable of lifting comfortably and holding the monitor in place. A standard monitor arm will usually accommodate monitors up to 27 inches, which usually weigh somewhere between 12 – 25 lbs. If you happen to own a much larger or heavier monitor, you’ll have to look at a more robust monitor arm. Now, this is where it starts to get fun! Although most people will only need the one monitor arm, there are options for dual monitors, all the way up to modular (and almost unlimited) screen setups. Even if you don’t need 2 monitors, some people opt for a dual monitor arm, using one for the monitor and the other arm to hold a keyboard and mouse platform in place. 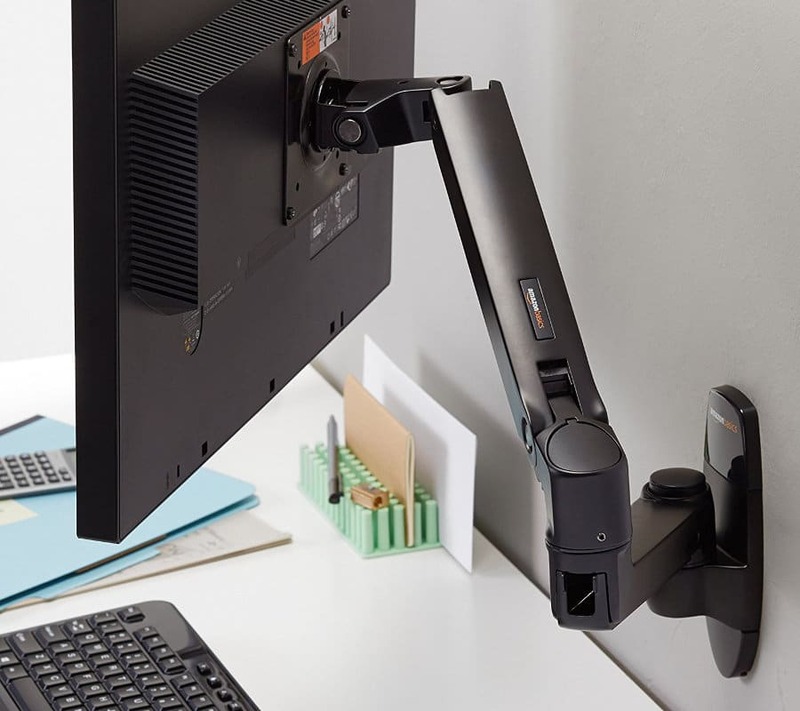 A wall-mounted monitor arm will give you maximum ergonomic flexibility, that is, tilt, pan, height, and angle adjustments. We highly recommend when getting a wall mounted monitor that you opt for this style. A sliding bracket can be useful for much heavier screens or monitors, but unfortunately, the maneuvrability is cut down to a bare just vertical adjustments. However, if you do have a very large monitor and you are looking for a very sturdy bracket, take a look at this one from ErgoTron. In the end, the vertical movement will be much more ergonomically friendly than a static monitor. The grommet clamp and c-clamp are very similar in function, in that they will secure your monitor arm to the back of your desk. The only difference is, the grommet clamp goes through the desk. Take note that you will have to drill a hole in the back of your desk in order to fit this style of clamp. Some argue that it could be sturdier doing it this way, however, we prefer the c-clamp style since you can easily move and replace it without doing excessive damage to your office desk. 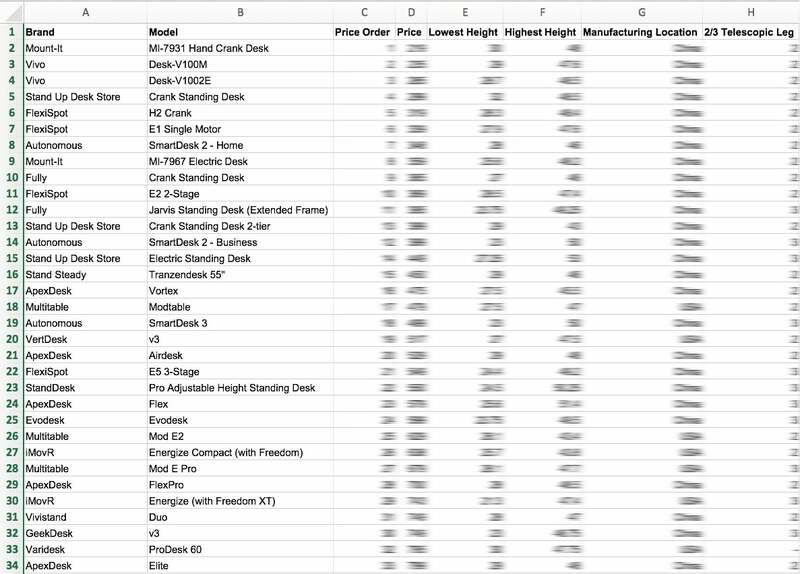 How much does a monitor arm cost? Probably the most important question to ask yourself (and maybe the hardest to answer). The reality is though, for the benefit you get in terms of your posture improvement and overall workplace health, the price is minimal for this product. A very cheap monitor arm could set you back around $30 – $40, however, if you’re looking for more adjustability, more screens and more robust, you could pay anywhere up to $200. As with all of these things, just stick to your needs and within your budget. No need to splurge on something with all the bells and whistles, when a $60 single arm monitor will give you the exact same benefits. The main purpose of your monitor arm will be to lift your monitor vertically away from the desk. There are two ways in which an adjustable monitor can do this. The first is a pole-mounted arm. The pole mounted arm is a long pole on which additional arms connect to your monitor. These additional arms can slide freely up and down the main pole to adjust the height, and can be locked in place at the desired height. They are a little more difficult to adjust, but for that reason, you can find cheaper albeit great quality monitor arms such as the Vivo Dual Monitor mount. The other style is gas spring monitor arms, which make adjusting the arms a breeze. These adjustable monitor arms are a little more expensive, but they truly make setting up your monitor as simple as possible. Whew… If you made it this far then kudos to you! We studied A LOT of different monitor arms and all the different options available to you, that it ended up being a long article! However, rest assured that after reading this you are now prepared for buying your very own monitor arm with no hidden surprises. Whether it be a desk mounted, wall mounted, single or dual, c-clamp or grommet, the most important thing is that you are comfortable using it. Buy something that you know you will use every day, fix your posture, relax your eyes, and relieve your pain.